I understand this is located in the Kenwood neighborhood. 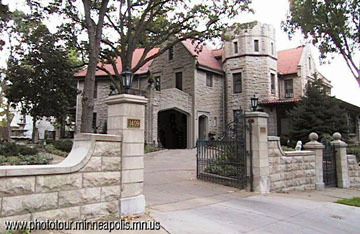 This “castle” is in the wealthy Kenwood neighborhood by lake Calhoun close to Uptown in Minneapolis, MN. Just thought you’d like to know. Just wanted to let you know that the "unknown castle" in Minneapolis is located at 1415 Mount Curve. I lived down the street from it for many years. All I know is that it's 13,000+ SF, 10 beds, 9 baths, and 5 fireplaces. Also, there's a tunnel from the mansion to the carriage house. Legend has it that it was used as an escape tunnel during prohibition. The castle in the picture of the Unknown Castle, Minneapolis, is known as the A. R. Rogers castle. It was originally owned by Arthur Ross Rogers until his death in 1936 or 1938. A friend of my father bought it in the late 1980s or early 1990s and owned it until 2000. It is not really in Kenwood. It is in an area just above Kenwood called Lowery Hill. The address is 1415 Mount Curve Ave., Minneapolis, MN.